The Committee Room recently spoke with journalist Thomas Vinciguerra about writer Wolcott Gibbs, whose acerbic and expertly crafted essays, criticism, and parodies epitomized The New Yorker for thirty years. 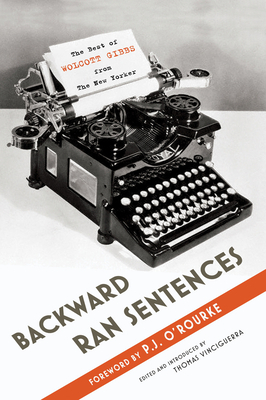 Vinciguerra is editor of Backward Ran Sentences, a collection of Gibbs' best work. Published by Bloomsbury in 2011, Backward Ran Sentences was welcomed by critics as a long overdue nod to an unjustly neglected talent. Terry Teachout in the Wall Street Journal called Vinciguerra's Gibbs collection "a marvelous tour of another era of magazine writing." Time's Michael Scherer suggested that readers "do yourself a favor and buy the book." In the Washington Post, Jonathan Yardley wrote in his review of Backward Ran Sentences -- "In his time there was scarcely anyone more skilled than Gibbs in the construction of English sentences. He was a master...Exceptional prose is far more of a rarity in journalism than most of us in the trade like to believe, so when it occurs it should be treasured and preserved."